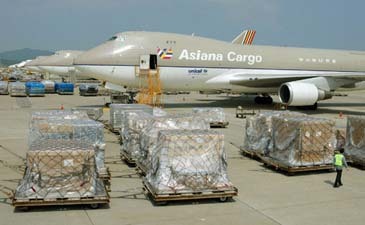 Air cargos are being piled up at the Incheon International Airport's cargo terminal on July 18, 2005 as Asiana Airlines' pilots continue to stage a strike. Asiana Airlines' unionized pilots continued their strike for the fourth day in a row on Tuesday grounding all domestic routes except for Gimpo-Jeju route and part of international flights at the height of the vacation season. Asiana Airlines has canceled an Incheon-Sydney flight scheduled for 8 p.m. on Tuesday and all cargo flights will be suspended from Tuesday. The airline said three canceled flights on Tuesday would take their toll on exporters by holding up shipping of 230 tons of liquid crystal displays, cell phones and semiconductor chips. In support of Asiana's unionized pilots now on strike, Korean Air's 26 Pilot Union leaders went on strike from Monday and promised all-out industrial action from Wednesday. A simultaneous walkout by Korea's two main carriers could spell chaos in the peak season. Asiana said it was to employ non-union pilots to minimize further disruption and maintain normalcy in flights to Jeju Island and air freight services. The strikes caused Asiana to suffer losses of US$2.4 million in sales as four of the company's seven cargo flights were suspended, the company said. The next day is likely to see increased losses as three cargo flights have been suspended due to the walkout. Asiana Airlines' pilots stage a strike in Seoul to improve work conditions. The three flights were to transport 230 tons of cargo including semiconductors, electronic parts and liquid crystal display panels. "If the strike goes on until the end of the week, we will be hit by 12 billion won worth of damage in air freight services, 10 billion won in international flights and 3 billion won in domestic flights," the company said. "The strike has had little impact on air freight traffic for exports until now, as Asiana's share of the nation's air freight market accounts for only 20 percent and other airlines have put flights on Asiana lines," said Kim Pil-gu, a senior official at the Ministry of Commerce, Industry and Energy. Some 300 Asiana pilots gathered at a training center near Incheon International Airport to discuss future strategies. The indefinite strike began at noon Sunday after last-minute negotiations with the airline's management fell through. Talks resumed later in the day but failed to produce an agreement on any of the 78 issues tabled, the company and union said. The pilot union is demanding that hours of movement between flights be counted in flight rosters. Other key demands include raising the mandatory retirement age to 58 and union members' participation in decisions concerning company promotions and disciplinary actions. The management is thought to be close to agreeing to most demands for better working conditions, but are refusing to accept the demand for labor participation in the company's personnel and managerial policies. Hopes for a settlement of the dispute remain as both sides are continuing to engage in behind-the-scenes negotiations. Meanwhile, union leaders of Korean Air, the larger of South Korea's two flag carriers are planning to convey guidelines for "intensified struggle" to its union members by Wednesday in a sign that the labor unrest could spread throughout the industry. The Korean Air pilots union is negotiating with the company over key proposals, including reducing the number of simulated tests of pilots' flight skills from two to one a year.